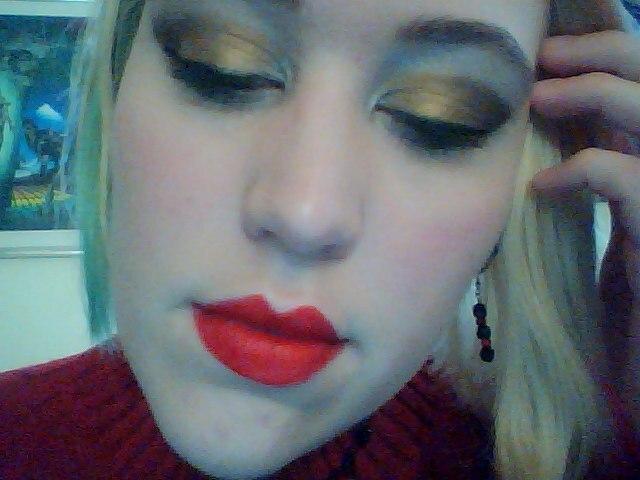 Also used Milani’s Liquif’eye liner in black and the lipstick is from a Sephora kit! Marilyn Monroe has been an icon for classic beauty. 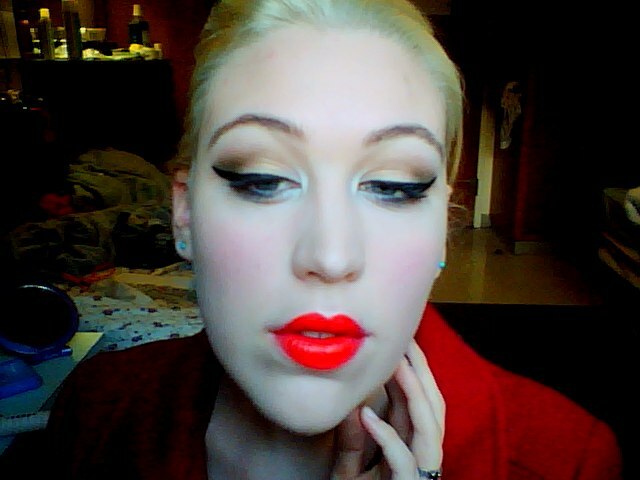 I was inspired by her look for a Pinup/burlesque Contest going on at Mon Ennui Cosmetics. Below is a tutorial on how to achieve her timeless look. 1. Conceal and use a foundation that you like, I used L’Oreal True Match in C1. 2. Set with powder on a Kabuki brush for a flawless finish! 1. Fill in your brows and try to create an arched shape, you can use a photo of Marilyn to help you out. 2. Apply a pale shimmery white/offwhite to the whole eye area. I used Mon Ennui Cosmetics Antique Pearl, a pearly shimmery highlighter color in an off white ( https://www.facebook.com/photo.php?fbid=221094364635633&set=a.196849527060117.47267.179910115420725&type=3&theater Photo of it here). 3.I then took a metallic silver and applied it to the whole lid area and extending it to the inner corner and under the eye. I used Mon Ennui Cosmetics Slipper a high shine metallic silver (https://www.facebook.com/photo.php?fbid=209697792441957&set=a.196849527060117.47267.179910115420725&type=3&theater Photo here). 4. I took a matte brown and lightly at first, drew a crease higher than my natural crease to create a large eyed illusion, similar to Marilyn in photos. I used the same brown that I filled my brows in. Darken this area as needed to create a sharp darkened crease for depth. 5. Take eyeliner of your choice, I used Milani’s liquif’eye liner in black and created a thin line on the upper lashline and extending it out to a small cateye. A good reference on how far you should go is to meet the brown shape you made in the crease area. 6. Take a brown color and using a liner brush accentuate the lower lashline. 7. Use a mascara of choice and use a few coats to get large lashes, add false ones if desired. 1. Use a liner to fill in your lips to get the desired shape. I already have very full lips so I just filled in my natural lashline but you can alter yours to be like Marilyn’s or create any lipshape you want. Fill in with the pencil. 2. Using a lipbrush or straight from the tube, apply a red lipstick (Monroe used reds with a more orange undertone but choose whatever red fits your mood!) 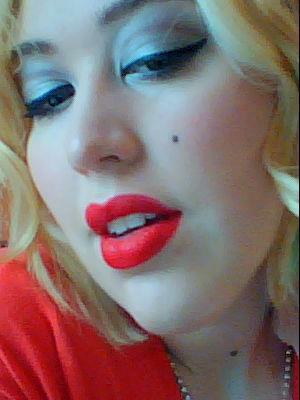 I used Besame’s Red Hot Red, a replica of Monroe’s favorite color! Clean up the edges with concealer/foundation for a crisp bold lip! 3. Take a small amount of the same lipstick and apply to the cheekbone area and BLEND! 4. using liquid liner you can either make a fake beauty mark, or accentuate a beauty mark that is already on your face (like I did!) I personally like to accentuate a beauty mark that I already have, it makes each look different in my opinion! 1. Curl your hair or use a wig! 3. Add a sassy dress! I hope you guys liked this tutorial! And head on over to Mon Ennui to make a pinup/burlesque look of your own! Hey everyone! here is a tutorial for this Holiday Look! Cheeks: Rub some lipstick onto your cheeks and blend well! Eyes: Take Mon Ennui Cosmetics Cursed Touch *Gold* and use wet application all over lid extending above the crease and creating a rounded edge. Take Mon Ennui Cosmetics Myrrh *dark burnished gold* and apply to crease and outer v area and blend outward to edge of gold, blend inward a bit. 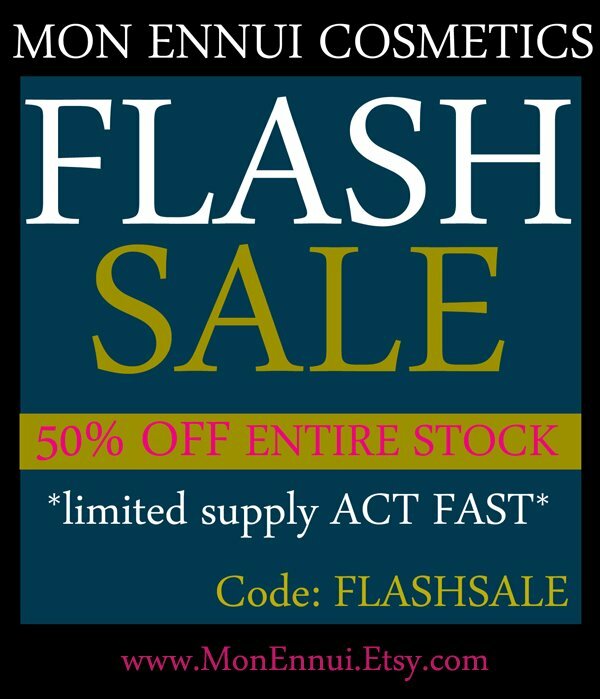 Take Mon Ennui Cosmetics Slipper *silver* into tearduct and under eye as well as highlight! (what is the holidays without lots of shimmery sparkleness! ) Take Myrrh again and put it under eye as well. Use black or green mascara on lashes and you are finished! Sparkly holiday glamour! I hope you enjoyed this look! Learn how to make the most out of your shiny metallic pigments in jars! One way is to use wet application for a totally different effect than using your pigment dry! 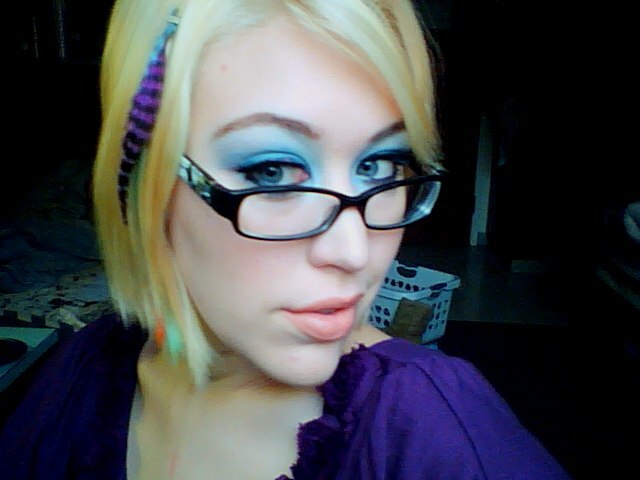 I’ll go over other uses later (foiling, lipgloss, blush) :] stay lovely fans! When I think of a colorful winter wonderland, I think of pastels and metallics. The spatter of color is reminiscent of the way snow flakes fall on you when you are walking around on a fresh winter day. 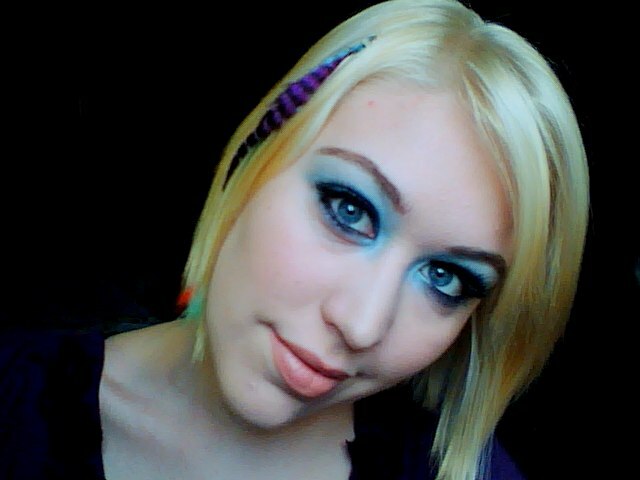 The lashes are coated in white also representing snowflakes collecting there during a snowstorm! The pastel colors are from the inspiration of a sunrise on a winter day with snow around, everything is softened so dramatically with the snow in its presence. The rhinestones are representative of the way fresh snow glistens when the sun reflects off of the ground. For this look I went very organic with shapes and soft blended colors in the lips and eyes to obtain a seamless mesh of pastel colors to represent the way the sky blends colors. 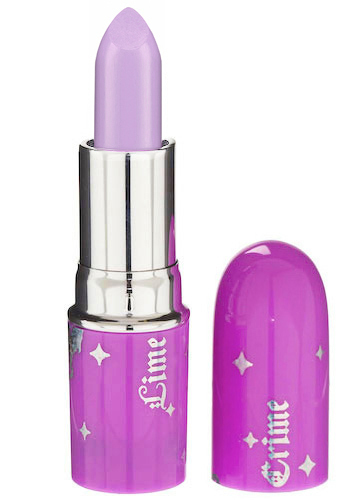 Lips: Lime Crime Opaque Lipstick in D’liliac on outer lips, then applied Lime Crime Opaque Lipstick in Airborne Unicorn to center lip. Hello! Today’s look is a color changing teal and purple cateye. These are two of my favorite colors so I had to do this look. 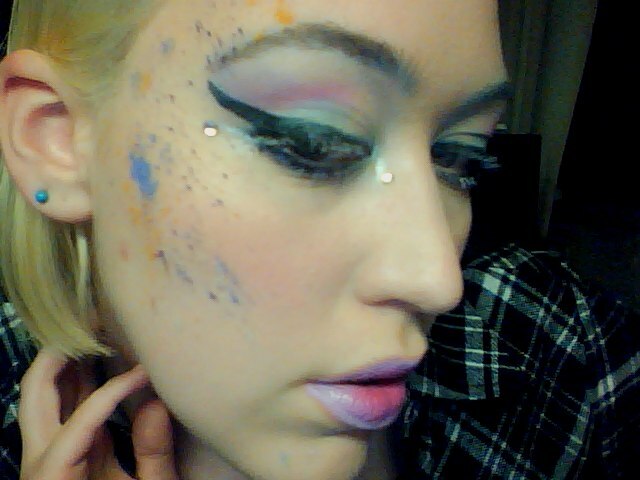 I had participated in a makeup look contest for Mon Ennui cosmetics. Everyone who entered recieved samples of the new colors and the two winners got the colors named after them! 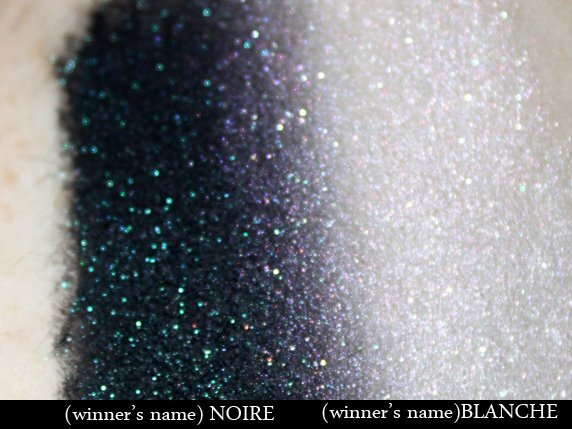 Lina Blanche, a shimmery white with purple sparkles, and Jaime Noir a black with teal sparkles. When blended together the color changing happens! It also comes out upon adding the shadow to water for a more metallic lavender and teal color. 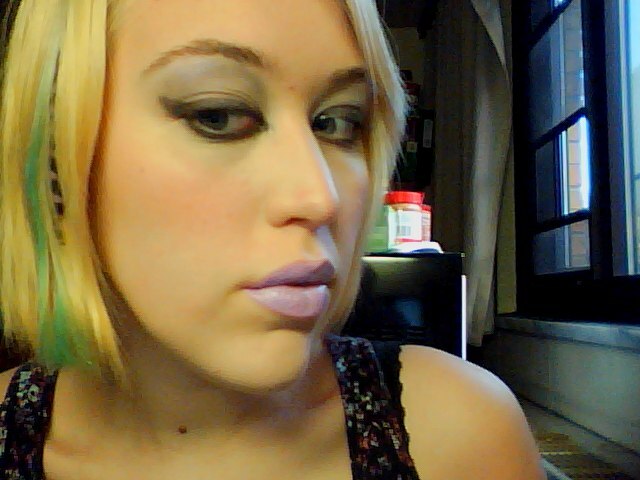 I paired this look with Lime Crime’s D’lilac since the colors were so so similar. I used a peachy blush to warm up the cool colored look. Don’t be afraid to use bold colors! Hello! I got a request for vintage pin up makeup with a twist, so I did that look today! For this look I kept the eyes neutral, but neutral does not have to be boring! I used metallic golds and silvers to make this look for modern, since the original look involves skin colored lids, a slightly darker brown crease to create depth, and a simple cat eye. All of these colors were matte. I love shimmery colors, so I decided to make this look metallic and chic. The most versatile and expressive part of this look is the cateye liner. This is the part where you can get creative and it is the staple, most identifiable part of this look. You can go super thick on the end like Amy Winehouse, or do thin and delicate, gradate the line, make a huge one covering your whole eye * I was considering it*. You can make this very unique by experimenting with colors and textures as well! Red lips are another staple of this look but don’t be afraid to try different reds or shimmers, or even black *I was thinking about it XD*. 5. using a dark gold *myrrh* on a small round brush and create a < shape on your eye *for right eye > * buff this color out as far as you like and bring it in a bit to the lashline and crease area. 6. 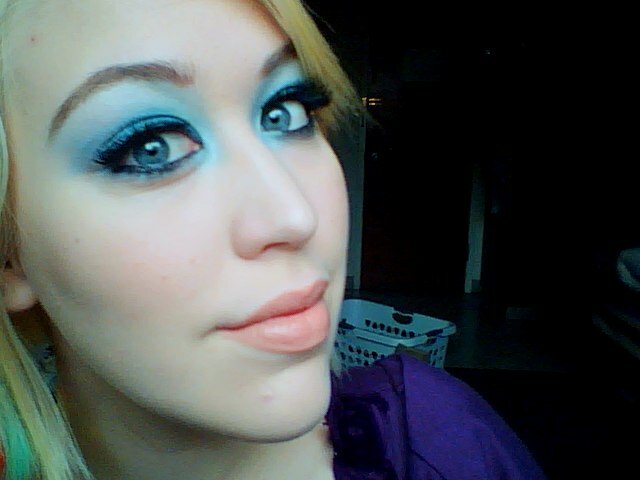 Reapply some Ennui to center of lids to make this color pop more! 7. using a black liner, create the desired cateye shape, don’t forget to lightly trace your bottom lashline and blend in with the silver for a soft line. 9. slightly darken brows- you want to accentuate the intense eye makeup with sculpted brows! 9. choose your wildest red! *if you DARE! * and apply to lips and cheeks. I opt for a matte color since the eyes have a lot of shimmer. Adding a bit of lipstick as a cheek color is great when you want to match your lipstick to your blush! You also get a very natural looking flush since it does not lay on top of the skin as much as powder would! Good luck and don’t be shy to be creative with color choices! Hey Everyone! 😀 Hope you are all doing well. 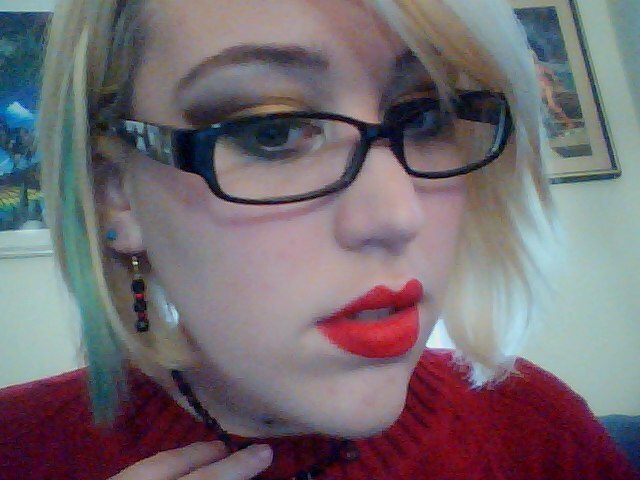 Today’s look was inspired by Allison Harvard of America’s Next Top Model and her new covergirl shoot. I found her makeup flawless and I thought the look was youthful and fresh. There are many different colors you can use and just a few rules to follow in order to create this look! First, use foundation and concealer to achieve a flawless face. Use a blush along the apples of the cheeks to achieve a natural, youthful glow. Next darken your brows, this will make this bold eyeshadow look even more polished. Pick what vibrant color you would like for your lids! This is where you can be creative! You can pick something that matches your eyes, your favorite color etc. As long as it is shimmery, it will work!. Line your lowerlashline and upper lashlines very closely with a black liner, this will define your eyes and make them pop! Adding a little at a time, put on the color you chose ( I used Mon Ennui’s Status Symbol, a shimmery blue/turquoise with green) and apply mostly to your lids but extending the color up lightly into your crease and browbone…if you have ever taken an art class, think of shading, but the browbone is going to be our highlight area! Take a shimmery white color (I used Dark Heart Designs Ghost Dog a white with red and orange sparkles) and applied that to my browbone and blended downward. This softened the look and made it extremely youthful and fresh. Apply mascara of choice and fake lashes if desired. Keep lips neutral/pinky/peachy. I hope you enjoyed this look, I had a lot of fun making it! Korean Skincare: What is a Sleeping Pack?